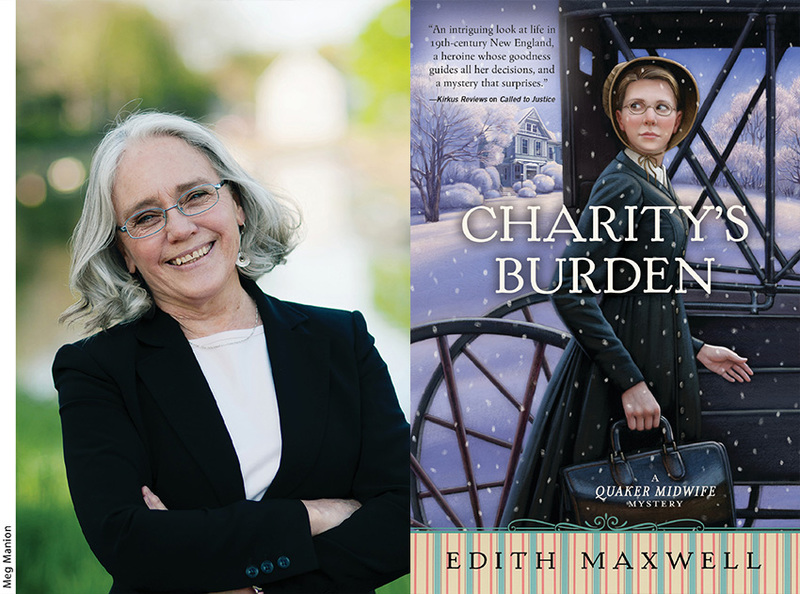 Edith Maxwell is the author of the Quaker Midwife Mysteries, the Local Food Mysteries, and award-winning short crime fiction. As Maddie Day, she writes the Country Store Mysteries and the Cozy Capers Book Group Mysteries—the first of which, Murder on Cape Cod, recently reached #1 on Barnes & Noble’s mass market paperback bestsellers list. Maxwell is a six-time Agatha Award nominee. She currently has 17 novels in print and four more on the way. 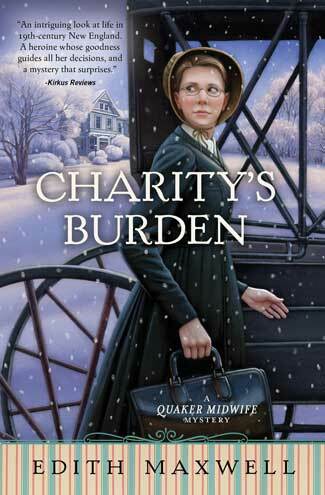 Her newest, Charity’s Burden, is the fourth entry in her beloved Quaker Midwife Mystery series featuring Rose Carroll. Recently, the author generously entertained questions pertaining to the evolution of her series, balancing standalone and continuing story arcs, how research influences her planning and plots, and the ways in which her protagonist is conflicted by her faith. She also reflected on changing publishers mid-series and offered a glimpse at what comes next. 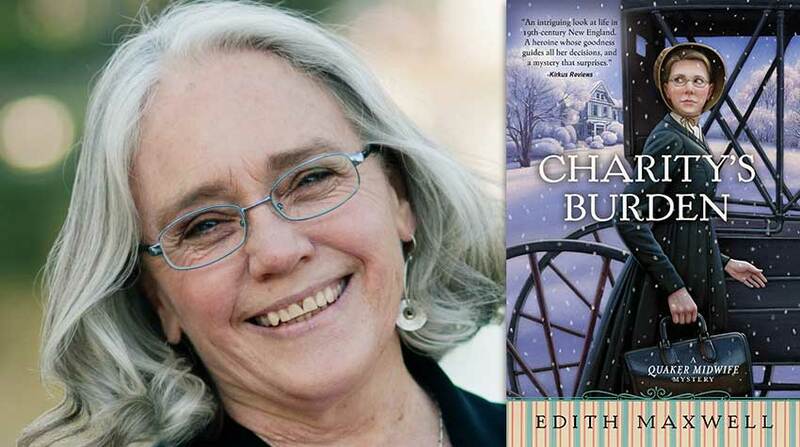 Charity’s Burden is your fourth Quaker Midwife Mystery. How has the series evolved since its inception, and in what ways does this book work as both a standalone story and a continuation of the overall arc? Over the course of the series, midwife Rose Carroll has grown more confident in her abilities to assist the police in finding murderers, especially when someone she cares for is falsely accused. Fortunately, Detective Kevin Donovan has become more welcoming of her help, too. Rose continues to grapple with crime in her town as well as obstacles to her personal happiness. Her betrothed’s mother still opposes Rose’s marriage to her son, David, and Rose’s own Quaker Meeting finds disfavor with her marrying a Unitarian. Any of my series books can be read alone and out of order, and each addresses a different subtheme along with the mystery. I’ve had fans report that they started with Turning the Tide, Quaker Midwife Mystery #3 (nominated for an Agatha Award for Best Historical Novel this year! ), and loved it on its own merits and because it addresses women’s suffrage. In Charity’s Burden, Rose Carroll suspects that a mother-to-be’s reputed cause of death (early miscarriage) is at odds with the symptoms she experienced. What was the jumping-off point for this premise, and how did the antiquated medical interventions of the period lend themselves to questions of murder and motivations? When I read about the highly restrictive Comstock laws passed in the early 1870s, I knew I wanted to bring this subject into a Quaker Midwife mystery. Women who come to midwife Rose when they are pregnant also consult her when they want to avoid becoming with child. They might already have five kids; they might be poor; they might want to pursue a career—their reasons for wanting birth control were as varied then as women’s are today. The new federal legislation made it essentially illegal—for the first time—to share information about preventing pregnancy. Massachusetts passed an even stricter version. Prior to then, even abortion before “quickening” wasn’t illegal (dangerous, definitely, but not against the law). After 1870, herbalists and others were forced to resort to evasive wording in the advertisements for their products, calling them products to regularize women’s cycles and improve their health. Certain practitioners also offered what I call in the book “mechanical” abortions—which, of course, could be life-threatening. I do my best to treat the subject matter with respect and in the context of the era. 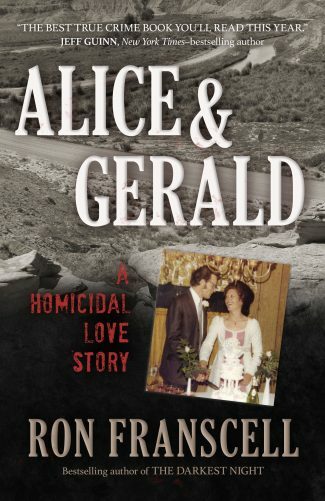 But when I considered the very real possibility of a botched abortion in 1889 and the potential for disguising a murder, I knew I had to write this book. What kind of research do you do to capture an authentic sense of time and place, and how do you endeavor to balance those details with more modern sensibilities for the sake of storytelling? I am constantly researching. Language: Was a word or phrase used in 1889? Midwifery practices: Rose knows to wash her hands but has no antibiotics, safe C-section, or ways to save premature babies’ lives. Daily life: What was it like to empty a chamberpot every morning and have to pump water into your kitchen sink? Carriages and horses and all the complications that mode of transportation entailed. Police procedure, the ways of Friends, national politics, the life of John Greenleaf Whittier (who is a supporting character), how much a bicycle cost, what a midwife charged for a birth. I look into all of this and more. I could talk for an hour or a day about my research (and have)! The books are set in my town, so I have maps and a wonderful local research librarian at my fingertips. Simply walking the streets through historic mill buildings and 19th-century homes puts me into the stories. I avoid anachronisms but do use straightforward language, except for when Quakers are talking because they addressed people with “thee” and “thy” at the time. Rose is an outsider, both by birth and by her faith, and an independent businesswoman. She might seem more modern to readers in her ideas than their notion of a woman in the late 1880s, but I think I have captured the possible. So many forthright and unusual women who never made it into the history books lived in those days. When we dig, we find them in diaries, news stories, and elsewhere. Rose is sometimes conflicted by her faith. 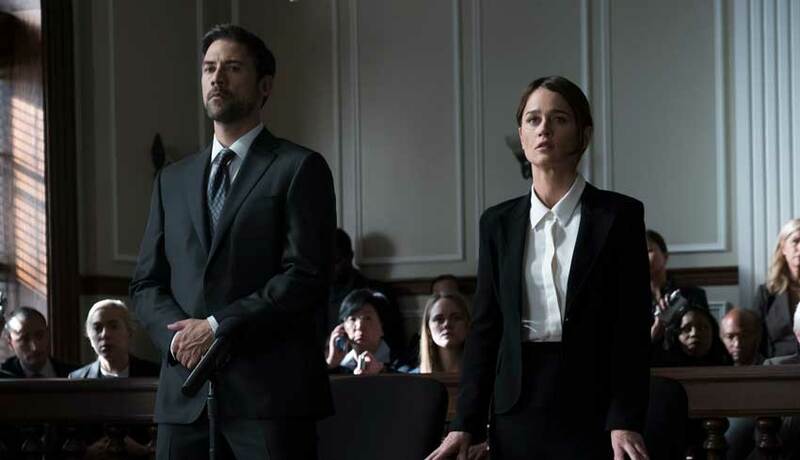 In what ways do her personal struggles influence her conduct, and how does this heighten the overall stakes/suspense? I don’t think she is conflicted by her faith as it pertains to her work as a midwife. The basic tenet of the Religious Society of Friends is, “There is that of God in each person,” which leads to the practice of equality, integrity, and non-violence. She lives these values when she tends to the women she cares for. In Rose’s recent avocation of amateur sleuth, she certainly comes into contact with violence, sometimes even against herself. So many forthright and unusual women who never made it into the history books lived in those days. When we dig, we find them in diaries, news stories, and elsewhere. The view that Quakers shouldn’t marry non-members is already becoming antiquated in Rose’s time, but Amesbury Meeting (in my fictional treatment of it) is resisting change. So her church comes into conflict with her personal desires, no matter how progressive and equality-minded her fiancé is. Luckily, Rose’s parents, along with her mentor Whittier, support her choice of life partner. The series’ next installment will come from a different publisher (after the shuttering of Midnight Ink). Tell us about the transition and why you feel Beyond the Page Publishing is a good fit for your vision. I was very sorry to lose editors Terri Bischoff and Amy Glaser along with Midnight Ink. Beyond the Page Publishing was interested, and I wasn’t done with Rose by book #4. Plus, it’s hard to move a series mid-stream. BtP offers a different publishing model from what I am used to, but publisher Bill Harris was welcoming, enthusiastic, and accommodating. As I now have a firm and avid fan base for this series, I feel confident we’ll do well. Look for Judge Thee Not to release this fall. It treats a theme of discrimination against differently abled people, against lesbians, against those traveling outside the norms of the time—all in the service of the mystery. I am under contract for at least two more books in the series after that. Leave us with a teaser: What comes next, both for you and for Rose? I also write for Kensington Publishing as Maddie Day. Strangled Eggs and Ham, Maddie’s sixth book in the Country Store Mysteries, will be out in June. I’m looking forward to writing the next Quaker Midwife Mystery this fall. Rose and David (Will they or won’t they be married by then? Stand by for news!) travel to West Falmouth on Cape Cod, which was a hotbed for Quakers at the time, to visit her two elderly aunts. Sure enough, both a pregnant woman and a murder pop up! Check out Edith Maxwell’s guest post, “Aspects of Police Procedure in the Late Nineteenth Century”! Thank you for the great interview. It was very nice to read your answers. I love this book very much and your answers are important to me.